With profound pleasure I am writing to the whole Society on the occasion of Pope Francis' proclamation that Peter Faber, "the silent companion" of the first generation of Jesuits, is a saint. On the day coinciding with his birthday, our Holy Father wanted to present to the universal Church a gift that is very significant and precious to him. The canonization of Peter Faber happens to coincide with another great event of our time - a Jesuit Kairos: the Bicentenary of the Restoration of the Society (1814). Without any doubt our beloved Savoyard companion can provide us incentive and drive for a dynamic restoration of our lives as Jesuits, personally as well as corporately, lives which are never complete for we are always on pilgrimage. That transparent, spontaneous, and childlike faith that Faber showed can help us persevere as "companions in His Company," convinced in an Ignatian way that "it is the Lord who does all things in us, and for whom all things operate, and in whom they all exist" (Memorial, 245). Bless the Lord, O my soul, and forget not all his benefits. Peter Faber chose this beginning verse of Psalm 102 to humbly open the door of his heart in his Memorial. It sums up in a few profound words the essential stance of Faber before life and before God: blessing, memory, and gratitude. 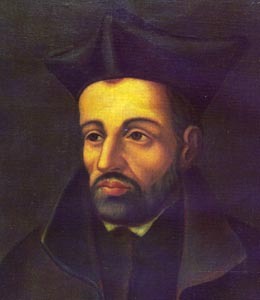 Although the human and religious stature as well as the great deeds of some of his Jesuit companions (Ignatius, Xavier, Laínez, Borgia, or Canisius) may have led us to overlook or even ignore the person and accomplishments of Faber, today we recognize in his life and legacy a way of proceeding that is genuinely Ignatian and profoundly rooted in the person of our Lord; Faber was truly a companion of Jesus. On the first day of August 1546 Faber passed away in Rome, barely forty years of age. He was the second of the First Companions of Paris to die, following Jean Codure who had died in August 1541. Faber had arrived in the Eternal City from Coimbra a few days before, arriving exhausted by the long and hard journey. Although his friends Laínez, Salmerón, and Le Jay were waiting for him in Trent with hopes of seeing him, word began to spread in Europe: "Master Faber is now found at a better Council, because he passed away from this life on the first of August" (Monumenta Lainii I, 52). Providentially, at the end of September 1529 three university students came to live together on the third floor of the Collège Sainte-Barbe as students of the Arts: Peter Faber, Francis Xavier, and Ignatius of Loyola. After five years of course work and shared experiences, at Montmartre on the 15th day of August 1534, Faber presided at a Eucharist at which the first seven "friends in the Lord" fixed their eyes and hearts on the same desire: Jerusalem. It was the beginning of an unanticipated project, the Society of Jesus, which continues with vitality and surprises today. In 1577, near the end of his life, Simon Rodriguez remembered Peter Faber who had died thirty one years earlier: "he had the most charming gentleness and grace that I ever saw in my life for dealing and conversing with people.... With his modesty and charm he won for God the hearts of those he dealt with." Faber is for us a Master of the rhetoric of the divine, someone who "in whatever subject and without disturbing anyone found material for thinking and talking about God" (Monumenta Broetii, 453). At the beginning of 1534, he made the Spiritual Exercises with Ignatius in the neighborhood of Saint Jacques in Paris. From that time on, as no one else, Faber penetrated the inner understanding of this method of conversation between the Creator and the creature, which he so delicately and accurately shared with others. Ignatius said of him that "he had the first place in giving the Exercises" (Luis G. de Câmera, Memorial, FN I, 658). In Faber we recognize a man of the Ignatian charism, molded by the method of the Exercises, disposed to look for and find God in all things, and always creative when the opportunity arose for "providing a method and order" for prayer to quite different people in the most diverse situations. His conversation bore fruit because it sprang from an inner life inhabited by the presence of God. Getting inside Faber we discover the mystic in history and in the world, rooted in time but living from the gift that always and in all things "descends from above" (Spiritual Exercises, 237). For Faber any circumstance, place, or moment was an occasion for an encounter with God. Master Faber was, above all but without claiming to be so, a Master of prayer. He understood that his friendship with Jesus was based on the mysteries of the Life of Christ, "lessons of the Spirit" for his vocation and his Christification, which he contemplated piously and from which he knew how "to reflect on so as to obtain some benefit." Faber prayed in constant colloquies with Jesus and Mary, with the angels and the saints, with the martyrs and his "private saints," among whom he counted his great tutor and master of his youth, Peter Veillardo, whom he considered a saint. He prayed about the elements of nature or the passing of seasons, about obstacles, about infirmity. He prayed for the Church, for the Pope, the Society, for heretics and persecutors. He prayed with his body and his senses. He was a believer in continual prayer, in a life infused by Mystery; he was convinced that God had made him a temple, and he remained in constant dialogue with Him. Perhaps it is in this spirit, rooted and grounded in Christ, that his apostolic activity, so varied and fruitful, makes sense: teaching catechism to children, preaching in court, giving colloquies in Germany, founding colleges in Spain (Alcalá, Valladolid) and Germany, teaching lessons of theology in Rome. Faber was given the experience and desire for being what another companions would later call a "contemplative in action." Among his other activities, Faber stood out as a Master of Reconciliation. Ignatius knew Faber's extraordinary gifts for conversation and did not hesitate to send him to the very center of a Europe in conflict. His was one of the most significant examples of that ministry to which the first Jesuits gave themselves so generously: "reconciling the estranged" (Formula of the Institute, 1550, 1). Similar to the spirit of our last General Congregation, Faber worked hard to maintain unity and to establish peace in a Europe that was theologically convulsed and challenged by religious questions and political-ecclesial conflicts: Worms (1540) and Ratisbon (1541) were some of the places where Faber sought understanding and harmony, which he saw with sorrow becoming ever more distant. And Faber united piety and erudition so naturally - a wise and discreet spiritual manner of expressing a deep theological foundation - that he was able to make the appropriate gesture or "say the right word." He carried deep within himself one of the guiding principles of the Exercises: "to try hard to save the proposition of one's neighbor" (Spiritual Exercises, 22): "whoever would like to help the heretics of this time should have much charity towards them and love them truly," communicating "with them familiarly" (Monumenta Fabri, 399-402). At the Society's origin, Faber's manner expressed our contemporary vocation of being present at the frontiers and being bridges of reconciliation. Following the footsteps and example of his beloved companion in Paris, Faber was also a Pilgrim who embodied the mysticism of travel so proper to the first Jesuits. "It seems that Faber was born to never remain still in any one place," wrote the Secretary of the Society (Monumenta Ignatiana, Epistolae I, 362). He traveled thousands of miles throughout the Europe of his time, a sign of his abnegation, availability, and obedience. He was frequently found engaged in "so many travels and exiles" (Monumenta Fabri, 419-420) that as a "perpetual stranger... I will be a pilgrim wherever the will of God leads me as long as I live" (Monumenta Fabri, 255), a will to which Faber spontaneously bound himself with his sense of obedience, making himself an echo of those words of the Centurion to Jesus: "come and he comes, go and he goes" (Mt 8:9). "For Him alone - for Jesus - have I changed houses many times [...] not infrequently have I gone to stay in places contaminated and dangerous for my body," there was cold, fatigue, intemperate weather, and poverty, but Faber always knew how to maintain his contemplative outlook: "may he be blessed forever who protected me and all those who were in the same situation I was" (Memorial, 286). Today, with serene happiness and "internal joy," we have reason to continue to see in Peter Faber our "elder brother." His manner of being present is a blessing for us; he is a reminder to be humble and to constantly return to our "least Society;" staying close to him, we distance ourselves from temptations to empty triumphalism or the powerful forces of arrogance. Faber is a call to a life of "having before our eyes first of all God our Lord," looking always to do His will in this His Institute (cf. Formula of the Institute, 1). Faber is a call to the care and attention to the Body of the Society, a call to dialogue and unconditional openness, of obedient availability and confident surrender. With Faber nearby, judgment is enlightened; "You have given all to me - to You, Lord, I return it." On the occasion of the canonization of this humble "friend in the Lord," we once again recognize, with "true happiness" (Spiritual Exercises, 329) and grateful wonder, the nearness of God to his Society of Jesus. Today his Infinite Goodness reaches and blesses us with the memory and presence of Peter Faber among us. The current season of Advent is a call to make level the ways of the Lord and prepare his coming. May the Lord Himself give us light to bring to action the best we are for the generous service of the Church. In Rio a young man catching the Pope's attention addressed him "Holy Father ...." Pope Francis responded, "Holy Brother what can I do for you?" HOLY BROTHER? Yes! Pope Francis is like a brother "who watched over and cared...." who is someone who, "in whatever subject found material for thinking and talking, his conversation bearing fruit because "it sprang from an inner life inhabited with the Presence of God." This post is an admixture like wine and water at Mass, of a few words of Jesuit Father General Adolfo Nicola's and St. Peter Faber. Reading Father General's entire article makes it very clear who profoundly affected the mystical and practical spirituality of Pope Francis - Peter Faber, in turn kneaded into Eucharistic dough so to speak, by Ignatius of Loyola, the Lord's "Master Baker."